PLO secretary-general Saeb Erekat accuses Trump administration of destabilizing the Middle East. Palestine Liberation Organization (PLO) secretary-general Saeb Erekat on Friday accused U.S. President Donald Trump's administration of fanning extremism and weakening political moderates, AFP reported. Erekat said Trump's decision to relocate the American embassy from Tel Aviv to Jerusalem, and his close alignment with Prime Minister Binyamin Netanyahu on issues such as Jewish communities in Judea and Samaria, were major destabilizing factors. "They're giving so much strength to extremism in the region," Erekat was quoted as having said on a conference call organized by the Wilson Center, a think tank on global issues. Erekat accused Trump of seeking to "dictate" a solution through his deeply contentious act of moving the embassy, as well as slashing aid to programs aimed at improving conditions in Judea, Samaria and Gaza and dropping the issue of “Palestinian refugees” from possible negotiations. 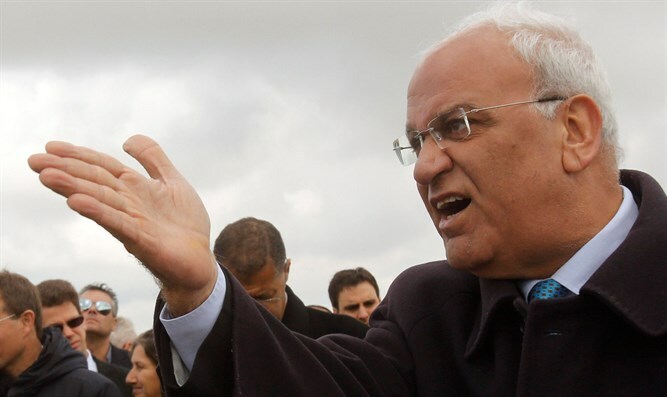 "This will not work for Palestinians," Erekat declared. "We have been weakened by the actions of Trump and the actions of Netanyahu," he claimed. While Erekat stressed that the anger level was "higher than any time before," he also said it was up to officials such as himself and moderate Israeli leaders to step up and help improve prospects for peace. "This is the absence of peace," he said, referring to the current conditions. "I don't see anyone expressing sorrow for one human life." His comments came several days after more than 60 Gazans, the majority of them Hamas terrorists, were killed while violently rioting against the U.S. embassy move on the Gaza-Israel border. Erekat also accused Trump's son-in-law Jared Kushner, who is working on an upcoming peace plan with Jason Greenblatt, the U.S. envoy for Middle East peace, of failing to support a two-state solution and not condemning the expansion of “Jewish settlements”. Trump’s move to recognize Jerusalem and relocate the American embassy to Israel’s capital angered the Palestinian Authority (PA), whose chairman Mahmoud Abbas has refused to consider the Trump administration an honest broker for negotiations. PA officials have repeatedly rejected the Trump administration’s peace proposal before it has even been made public, and are claiming it was coordinated with Israel.